audience. Our 2018 field naturalists Lindsey Cathcart and Sarah Crosby did a great job showing groups all the details of monarch tagging, and our field coordinator Louise Zemaitis worked with a third group. These demos continue each Friday, Saturday, and Sunday through Oct. 14, with more demos the following weekend as part of the Cape May Fall Festival. Monarch numbers around Cape May are still modest, as recent warm weather has not brought migrants into our region. We suspect that most of the monarchs we have been seeing began their lives nearby; we continue to see many eggs, caterpillars, and chrysalides in the gardens throughout southern New Jersey. We did get one surprise on Friday: a previously tagged monarch was netted in Cape May Point at about 1:30 pm. We have reported this find to the folks at Monarch Watch, who maintain the tagging database, but we're hoping someone who follows our project may have been the one to tag this butterfly. The tag code, as seen below, is YBR 728. Our project this year has been issued tag codes beginning with YBX, YBY, YBZ, YCA, YCB, and YCC. We are often asked to predict when the biggest numbers of migrants can be seen in Cape May Point. Sadly we can't predict, though we do know that cold weather fronts that bring northwest winds can often bring monarchs into Cape May. One thing we can promise: we'll post quickly in the blog whenever we see the numbers of monarchs increasing here in Cape May. In the meantime, we hope you'll come visit and attend one of our tagging demos. A few more photos of our first demo are shown below. 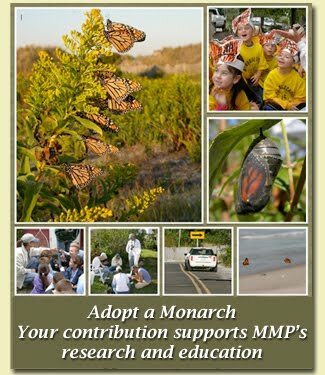 DON'T BRING MONARCHS TO CAPE MAY!